MOBI's Digital Ultra Thermometer can be used to measure body temperature from the ear OR the forehead, and can also be used as a room thermometer with clock and calendar features. It is designed with the most up-to-date technology incorporating a unique human voice readout feature, a large backlit display and flashlight to aid in taking temperatures in dimly lit areas. Scanning temperature at measurements makes this product an easy-to-use solution when time and accuracy are critical. Easy-to-clean, washable tip for added convenience, and a table stand make this thermometer the ideal health and safety item. The manual states that this thermometer should be calibrated "at time of manufacture". Unfortunately the unit we had was not. According to this thermometer, the room we were in was 77 degrees (when it was more like 66 degrees) and both my wife and I had temperatures under 96 degrees. This was using both ear and forehead tools. Poorly calibrated, annoying "talk" feature. In my experience ear thermometers generally read a little high, but this one was ridiculous: it repeatedly spat out temperatures in the 105 degree range, and we tested it against other thermometers that were giving us normal temperatures in the 98-99 degree range. That's some bad calibration, and there is no way to reset it. Also, the "talk" feature is really annoying. The voice has an odd New York accent, which is fine but it scared the heck out of my nine-month-old daughter. You can turn the "talk" function off, but it resets itself for each use and defaults to being on. That's the last thing you want when you go to take a baby's temperature in the middle of the night. We have this in our baby medical kit - use it ALL the time!!! Great features, good price, unreliable readings. This looked like an excellent product - just what we needed for our preemie twins, but we could never get verifiable results. Check their temp 3 times, get three different results. I even tried it on myself several times. In the ear seemed to possibly work, but their ears are too tiny to that, plus they tend to move a lot. I love that you can use this product on the forehead or in the ear. It's true that it gives varying readings, but any thermometer will do that depending on where it's placed on the forehead or angled in the ear canal. I always take 3 readings and go from there. You are not supposed to take readings in the ear on infants less than 6 months old (their ear canals are not angled right), so the forehead/temporal setting is way cool. 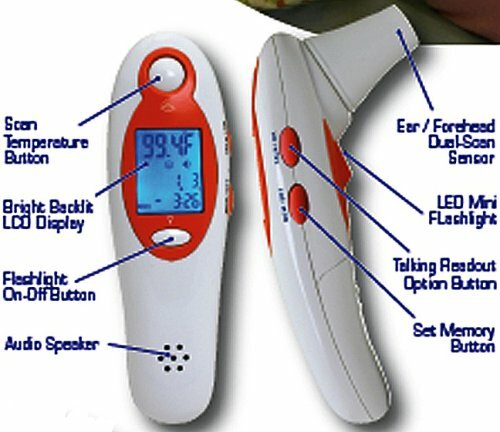 I work in a pediatrician's office and use a popular competing ear-only thermometer, I've found it gives varying readings as well. It just depends on placement. My 21 month old was wary of this at first, but after a few times of using it, he loves it. He WANTS me to take his temperature whenever he sees it.